Dinner at Christina's: Wanchai Ferry Review & Giveaway! Last week I received a package of Wanchai Ferry new beef and broccoli frozen meal. It was packed in dry ice, which was pretty cool because it is not yet widely available. I also received two gorgeous tea sets with an iridescent (that word will always reminds me of Dirty Dancing) mugs, tea strainers, and loose organic green tea. I received the tea sets first and Johnny and I love them. The mugs are gorgeous and wrapped up nicely with the strainer and loose tea in a little net bag. They would make great gifts if you are selfless enough to give them away! Then a few days later the dry ice pack came with the beef and broccoli. The ingredient list is long, but the majority of it is spices and flavoring for the sauce. I do like that there is no MSG added, but I did not like that there was whey protein concentrate added. It is most likely there to boost the protein (18g per serving), but meant that Johnny could not eat it with me. The bag contains the loose beef and vegetables, a separate sauce pack, and a separate rice pack. While the beef, veggies, and sauce cook on the stove, the rice is cooked in the microwave. It was a little sweet for my taste (3 sugars listed on the ingredients) and also has 55% of your daily sodium. But I do have to say, I was really impressed with the amount of vegetables and the quality of all the ingredients. There was a ton of bright, green broccoli and the beef was really tender and flavorful. It was also really easy to prepare, with minimal effort in about 10 minutes. A lucky Dinner at Christina's reader will win a package like the one I received! 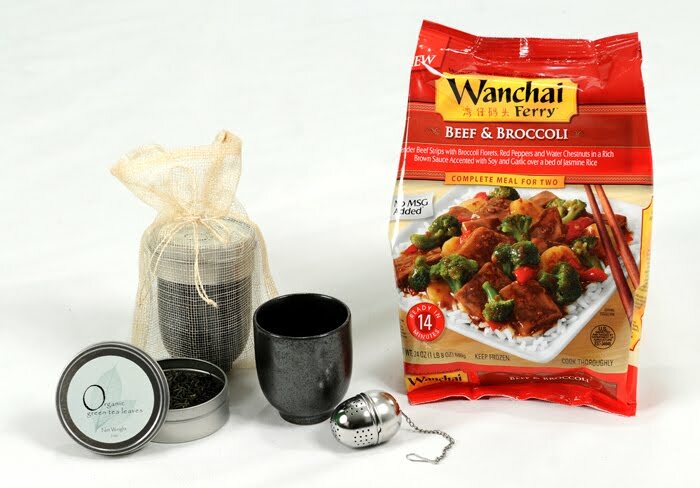 Included is a frozen package of Wanchai Ferry frozen beef and broccoli (serves 2), two tea mugs, two tea strainers, and two tins of organic green tea. There is a chance for three entries. Please leave a comment for each entry. Entry 1 = Leave a comment below telling me if you have ever tried a Wanchai Ferry frozen meal before. Entry 2 = Blog about this giveaway and leave an additional comment with a link to the post. Entry 3 = Tweet about this giveaway and leave an additonal comment with a link or @yourhandle. Contest will run through midnight June 8th. Winner be announced June 9th. The frozen meal and tea sets were generously provided compliments of Wanchai Ferry and MyBlogSpark. The review is my honest opinion of the product. i've never tried their product before. I've seen these in our local store, good to know they are a good product! Thanks for the chance to try!! I have never tried this brand of stir fry, as I usually make our own...but I'd love to try! Thanks for the opportunity, I enjoy reading your blog. I've never tried Wanchai Ferry, but the dish looks really tasty! @erinjmt: I really want to win the giveaway @dinneratxtinas is having! I'm a big tea drinker and the Wanchai Ferry meal looks delish! I have not tried it before. I want to....but really hate poor chinese food. So, unless I get a great review from someone, I can't stomach the thought of it. I have tried the Orange Chicken and it's pretty good! I love Wanchai Ferry! We had the shrimp dinner last year and it was good! I have, I think it was Orange beef. It was pretty good. ive never tried a wanchai ferry meal before, but they look very yummy! I don't believe I've seen their frozen variety at my local store yet, but I have seen their boxed varieties on the shelf. I haven't tried either but would love to have some good, quality Chinese food at home! I've been wanting to try this brand but can't find it locally! I've never tried it but it looks delish! I've never tried Wanchai but I get their coupons often, can never get them while their in stock! I haven't tried their products, but I have heard good things. I've never tried one before but they do look yummy. I haven't tried it but would love to! By the way, I love your blog! I haven't ever tried the food before, but I've seen the commercials and wanted to try it. Never tried this product before- Will have to look for it. Do love all things tea though! I have never tried their product before, but it looks so yummy that I would love to try! no I haven't yet - I'd love the chance looks delicious! I haven't--I'm allergic to wheat, but the tea looks delicious! I have not had the chance to try their frozen meals yet. I do love their boxed meals though. I haven't had one yet, but this blog entry makes me want to! I've tried them before and I LOVE the sweet and sour chicken! In fact, there is a bag in my freezer right now! Haven't tried but I've been wanting to. Great giveaway!! I haven't tried Wanchai out and I would love to! Thanks for the chance to win! No I haven't tried this before. Actually I have had a Wanchai Frozen Meal - chicken of some kind about a month ago. I remember it being very good. I've never tried Wanchai Ferry before, but I would like to. I have not tried these meals before, but would like to, now that I've read your review. I've tried a Wanchai Ferry frozen meal before and love them :) *Thanks* for the giveaway! I've tried their garlic flavor once, it was great! I haven't tried them yet, but, I hope to. I haven't had Wanchai Ferry before...but it sounds tasty! Also, that tea looks pretty good, too! I haven't had the chance to try Wanchai yet~Thanks for a chance!!! No, I've never tried a Wanchai Ferry frozen meal before, but I would like to. Some nights, it's nice to have a hot meal without having to cook it yourself. I've never tried Wanachai before. Too bad for me!